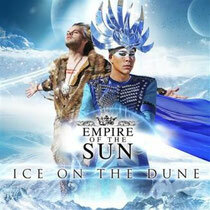 Empire Of The Sun recently unveiled the cover art and track-listing for their second album ‘Ice On The Dune’, which is released on Monday June 17. ‘Alive’, the first single to be released from the album is exclusively available as an instant grat on iTunes from today, with the full bundle available on Sunday June 16. The news follows the recent announcement that the band will return to the stage to headline the upcoming Vivid Festival at the iconic Sydney Opera House. The two shows on Thursday May 30 and Friday May 31 will see EOTS premiering tracks from their new album, as well as playing classics from their award-winning debut. ‘Walking On A Dream’. The band has also been confirmed as headliners for UK arts led Wilderness Festival on Friday August 9.